San Francisco, and Los Angeles, CA. Publisher: Leidecker & Morch. Editor: Marie A. Walsh, Louisa A. Off, Jerome A. Anderson. 1/1, June 1891-3/12, June 1894. $1.50 a year. 5 x 8 1/2, 32 pp. 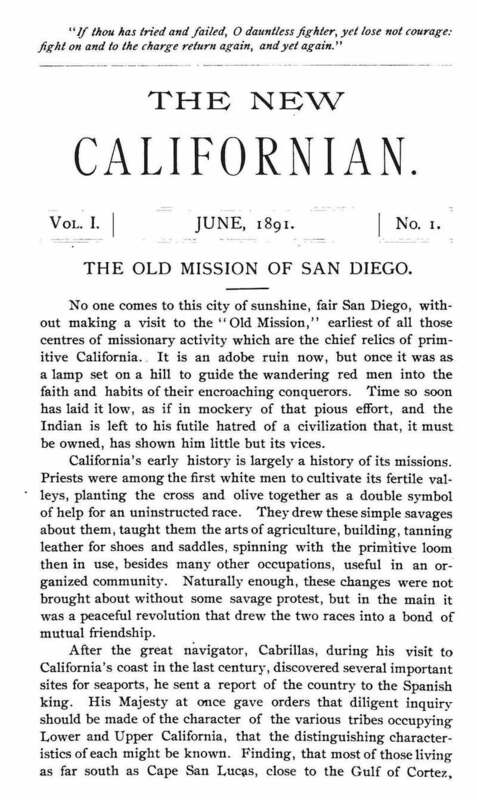 Despite the title, this was basically a Theosophical journal with much filler on local California color. Edited by Louisa A. Off ( - 1895) and Marie A. Walsh, and contributions by Ella Wheeler Wilcox, Joaquin Miller, J.D. Buck, et al. The contents of the journal, prepared by the Australian Theosophical Society, are now online at http://www.austheos.org.au/indices/NEWCAL.HTM. California State Library; Pasadena Public Library; Sacramento Public Library; San Jose State University; University of California, Irvine; University of Minnesota; University of Chicago; University of Pennsylvania, and other locations in OCLC. ATLA microfilm.